Shopify Review: What’s all the hype about? Let’s face it, choosing the right ecommerce solution can be a pain – I’ve been there, comparing shipping options, payment processors, SEO performance, costs and much more. Is Shopify really the right tool for you? Well, with this detailed Shopify review, we’ll discover if it’s actually a good fit for your project or if you should look at alternatives like WooCommerce, BigCommerce or Wix. If you can’t be bothered to read this (long) Shopify review, find a short video below I’ve put together so you can get an idea of what to expect. Background check – What is Shopify? Back in 2006, a German youngster living in Canada decided to sell snowboards online. He created his own ecommerce solution and soon realized others could also use it. Fast-forward several years and Shopify has become the #1 tool for many (and that youngster is now loaded). Shopify is the leading ecommerce solution with more than 800,000 online stores, offices around the globe, $63 billion worth of sales and over 3,000 employees. As I see it, Shopify is not only an easy way to launch and manage your online store. It’s geared towards supporting store owners in crucial aspects like opening additional channels (e.g. Amazon, eBay or Facebook), offering customer support tools (e.g. live chat) or by taking care of the technical hassles. Shopify’s Online Store can be tested for 14 days for free here. Sell unlimited products. Shopify will charge a 2% transaction fee unless you use Shopify Payments. With more ecommerce features like gift cards and abandoned cart recovery. Transaction fees are 1% unless you use Shopify Payments. Get advanced reports and automatically calculated shipping rates. Transaction fees are 0.5% unless you use Shopify Payments. Additional plans: The Lite plan to sell on social media can also be purchased for about $9 a month. Shopify also offers an enterprise plan (Plus) for gigantic online stores – it’s not cheap as it starts at $2.000 a month. Check our Shopify pricing comparison for full details. Fortunately, you don’t have to worry about technical stuff at all. Nearly everything can be done with a few clicks. Shopify provides great beginner guides and extensive documentation. Both quality and quantity of their designs are excellent and they are mobile-friendly (responsive). In case you don’t find one that fits your needs among the roughly 170 themes, you can either create your own (using the Liquid template engine) or buy one. The core system and templates are already great, but it doesn’t stop there as you have full access to the code. Shopify is very powerful, but still user-friendly. It’s easy to scale for small and big online stores. Shopify App Store is packed with useful (free and paid) add-ons for your store (e.g. email marketing integrations). On top of that, they have a large community of independent developers and experts ready to help you. Unlike open source solutions like WooCommerce or Magento, Shopify has a 24-hour support team. In our support tests, they scored an excellent result. Blog post, as well as regular pages (e.g. ‘about us’), have a URL structure that is not ideal for SEO. Shopify uses subdirectories such as /pages/ or /blog/news/. Unless you use Shopify Payments (not available everywhere), Shopify charges a transaction fee on top of the payment processor fee (e.g. Stripe or PayPal). Although Shopify comes with a blog and you can create other types of pages (e.g. product landing pages). Getting your non-ecommerce content looking the way you want is not so easy. Shopify has a huge number of features, but it is logically structured. Setting up an online store is not really complicated. Designing and arranging elements can be done with a live preview in the backend. Shopify templates are modern-looking and responsive (compatible with tablets and smartphones). There’s also enough variety to choose from. It comes with most of the SEO features that online stores need. A downside is that some URLs get extra terms added (e.g./products/ or /collections/). Check our detailed SEO review for more information. Zoom function, picture gallery, video – it’s all possible. First you define your options (e.g. size, color, material), then you add the variants (e.g. S,M,L,XL). From that Shopify will then generate all possible combinations, which can be up to 100. If you need more you can use one of their apps. In the “Shopify” plan there is an “Abandoned cart recovery” feature integrated. Among other things, it allows you to remind your visitors with an automatic email to complete their purchase. Buyers can leave a product and user feedback. Add your own SKU (Stock Keeping Unit) numbers to each product. It is possible to limit the number of downloads or the time of availability. Delivery is handled via email. Supports the new rules on charging VAT for digital goods in the European Union. Customer data and payment transactions are encrypted via SSL (https). Included at no additional cost. You can even use your own checkout domain. Visitors can check out with a guest account or create their own personalized login. It’s even possible to let your customers decide whether or not they want to create an account. Fixed price, percentage, free shipping, buy one get one, etc. You can set a maximum amount of usage and expiry date. Shipping rates can be set for each country individually or by shipping carrier (UPS, FedEx, etc.). You can also choose fulfillment/dropshipping with services like Amazon. Absolutely possible. Shopify’s App Oberlo makes the whole process much easier. The basic version is free and offers an extension to import directly from AliExpress as well as plenty of other suppliers. Find out more in our review. 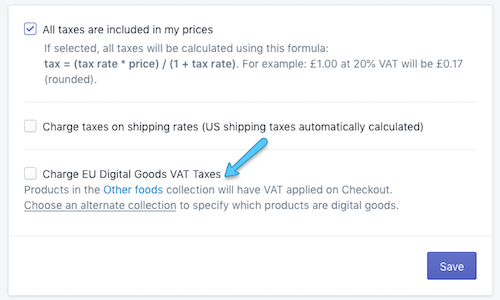 Shopify can pull US tax rates automatically. Individual tax rates for other countries can be set individually. Allows you to display VAT prices on your product pages. Shopify tracks all items you have in stock. There are also settings to receive notifications automatically. There is also a POS system to manage both your online and offline inventory. This allows you to receive offline payments via an iPad. Yes. You can edit every notification email as you wish. Product data can be imported from Magento, eBay, WordPress and CSV. This saves a lot of time and makes moving previous web stores to Shopify easy. Exporting a CSV-file is also possible. Shopify offers reports in its “Shopify” plan and higher; product reports, order reports, and more are available (you can see how orders vary from month to month, for example). Moreover, it’s always possible to integrate Google Analytics. Export your orders in a CSV-file. There are also direct integrations for accounting tools such as Xero and QuickBooks. An excellent solution both for ambitious beginners and professionals. Shopify offers you a platform that makes selling not only easy but also provides the tools to improve your sales. Definitely not the cheapest solution out there but thanks to their support and ecosystem, Shopify takes much of the headache out of running an online store. Try it for free. Let me dive into Shopify’s functionalities and tell you a bit more of what I think of it. Hopefully, this will help clarify some questions you may still have. It’ll be long, so skip to the conclusions if you are in a rush. Don’t be mistaken, although Shopify is really easy to use, it’s an extremely powerful tool too. For example, you can set up and launch your online store in one weekend (no joke). But you could also spend days or even weeks developing a custom solution to fulfill your needs. Personally, I think Shopify lets you do more with fewer clicks than competitors like Volusion or BigCommerce. And Content Management Systems such as WordPress or Magento don’t even come near in terms of ease of use. I also find their backend intuitive and straightforward to navigate. Whenever I got stuck, all I had to do was check their tutorials or ask support on their live chat – most of the time support was helpful and quick to answer. Shopify is not short on templates and they generally look modern and professional. They are also responsive, which means that they’ll look great on any device – Google really likes this last point. Sadly, they only offer a handful of free templates (about 10) – I really wished they had a couple more. However, if you have a budget, you can buy one of their paid themes that cost between $140-180. Another option is to purchase a theme from an external marketplace like Themeforest, where prices are generally lower (around $50). Or if you need a specific design you could get one exclusively developed for you from one of the many Shopify experts. In terms of template customization, Shopify gets it right. I find it super easy to personalize store templates. Changing global styles is a walk in the park (e.g. colors, fonts, or social media buttons) with the theme editor menu. Even cooler is the way they let you add, remove or even move sections up and down with a couple of clicks. The shortcoming here is that you are limited to the available sections of your template. But let’s cut to the chase and review Shopify’s ecommerce features. 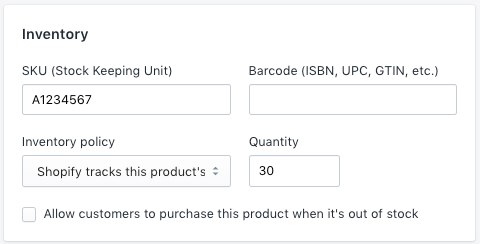 Products can be added easily using Shopify’s interface or you can even import your products via a CSV file – this last option is pretty useful for large online stores. Sidenote: It’s also possible to import and export other pieces of data like customer lists, orders or even reviews using CSV files. Filling in the product information is intuitive (e.g. title, description, images or videos, price or SEO options). Finally, collections (category) can be assigned to keep your online store tidy. The SKU (stock-keeping unit) and the inventory tracking features let you manage your stock more efficiently and prevent you from selling out-of-stock items. You may require to sell several variants of the same product. 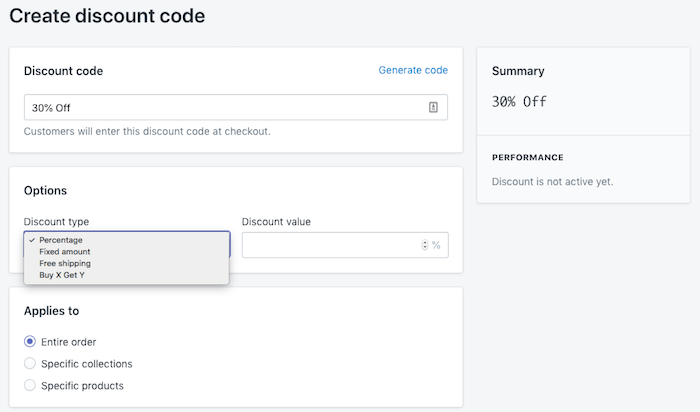 Be aware that Shopify will let you add a maximum of 3 variants (e.g. size, color and material). The system will then generate all the necessary combinations, and individual inventory tracking can be setup. The cap is at 100 combinations (unless you use a paid app or edit your theme’s source files). BigCommerce, on the other hand, supports up to 600 combinations. This could be limiting for projects with complex products but will be enough for most store owners. To sell digital products (e.g. videos, images or documents) with Shopify, you’ll need to install a (free) app developed by Shopify themselves. To be honest, I am a bit surprised that this isn’t available out-of-the-box, but it works. Creating a subscription store or taking recurring payments can get expensive. You’ll either need an app or a developer to code this for you. As far as I know, other competitors (e.g. Volusion or BigCommerce) don’t integrate this either. Some projects require custom fields so users can leave feedback when purchasing products (e.g. engravings for watches or rings). With Shopify this isn’t integrated natively, you’ll need to tweak your code (really not that easy) or get an app to do the job. This only takes a couple of clicks with BigCommerce. Categories (or collections as Shopify calls them) can be manually assigned to products to group them. For example, let’s say you sell pet food, you could have a collection for dogs, cats or snakes. Then Shopify will automatically generate a page for each collection showing all the included products. But – there’s always a but- be aware that creating sub-categories with Shopify (e.g. puppies food or senior dog food) isn’t possible unless you use a complicated workaround or an app. Pro tip: Try setting up automatic rules to create collections. For example, create a ‘Promotions’ collection with all products that currently have a discount – you see how powerful this can be, right? As far as I know, Shopify has more online payment processors than any other alternative – over 100 providers. As you can imagine, big names like Stripe, 2Checkout, PayPal or Authorize are included. And yes, they also have their own system, Shopify Payments (powered by Stripe). One of my biggest issues with Shopify is that they will charge extra transaction fees if you don’t use Shopify Payments – 2%, 1% or 0.5% depending on your plan. Sadly, Shopify Payments is not available in every country. So if you can, do use it. Sidenote: Shopify Payments is currently available in the US, Canada, UK, Ireland, Australia, New Zealand, Germany, Singapore, Japan and Hong Kong. However, there are rumors they have plans to launch this in other countries soon. On top of that, manual payment methods can be enabled too. For example, cash on delivery, bank deposits or money order. Remember, on these orders you won’t have to pay any commissions to Shopify. In my experience, ecommerce logistics (shipping) can get tricky and having an efficient system can save a bunch of time and money. Shopify is excellent here, no doubt. But let’s quickly review their shipping system. Shipping rules can be set up easily (e.g. flat rate, free shipping, country or region based rates) from their backend for individual products, collections or for your entire store – nothing too exciting here. But the shipping fun begins with the live shipping rates. This sytem connects your store with carriers (like USPS, FedEx, UPS, etc) and provides accurate shipping costs during checkout. Sidenote: Live shipping rates are only available for some countries (e.g. US, Canada, UK, Australia, New Zealand, Ireland, etc). When fulfilling orders, you can buy (discounted) shipping labels from Shopify’s backend. You only need to print it and stick it on the parcel – a big-time (and money) saver. Please note that for this to work, you need to specify the weight of your products. Shopify is the leading solution for dropshipping – an ecommerce model where the order processing and fulfillment are done by someone else (a dropshipping provider). 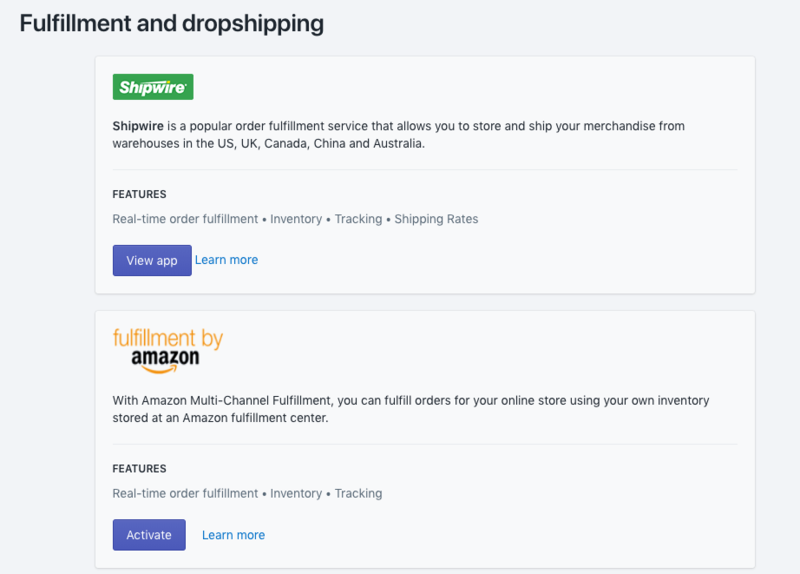 By default, you can connect your Shopify store to several dropshipping providers like Rakuten, Amazon Fulfillment or Shipwire. Other services can be manually connected (via email) if you need to. Some solutions such as Oberlo, can be added via the App Store. I am not good at maths, so I appreciate online store solutions that make my life easier – especially when it comes to a topic that nobody likes: taxes. Shopify doesn’t do anything too impressive with taxes, but I like that it doesn’t require rocket science to set it up and it actually works. You can display prices including taxes or excluding them, whatever works for you. Shopify includes an automated tax calculator by ZIP code – only for US based stores. Manual tax settings can also be added for countries or regions. Sidenote: If you are targeting customers in Europe, you can also adapt the taxes settings to comply with the European legislation, even for digital products. This means letting your business customers shop VAT-free, using the reverse charge-mechanism, however, this will require an external app. Having your own online store is a first step. But if you are an ambitious marketer, you probably want to explore different ways to sell your products. Sell your products directly on Facebook – Shopify will create a shop section on your Facebook page. Sell your products on Instagram by tagging your products. Selling on Pinterest is also an option for Shopify store owners with a Pinterest business account. Similarly, you can connect your Shopify store with Amazon to sell on this popular marketplace. eBay is another available marketplace. See the potential, right? There are other Shopify sales channels (e.g. BuzzFeed, Wanelo, etc.) you can explore. Check this list for more details. But what is the advantage of these? You maintain and manage your sales from one place (your Shopify backend). I have to say that some channels work smoother than others. For example, with the Instagram integration, many users have issues getting their store validated. As any other store builder, Shopify provides you a bunch of tools to (try to) increase your sales and help your business. Discount codes can be added to your Shopify store easily. They are very flexible as you can set codes for fix amounts, percentages, free shipping or even buy this product and get that one for free. You can also promote gift cards for your online store. But be aware this feature isn’t available with the Basic Shopify plan – strange decision. Shopify doesn’t come with a loyalty program (e.g. collecting points with each purchase). If you’d like to implement this, getting an app (like Smile.io or S Loyalty) is your easiest and cheapest option. Online shopping abandoned cart rate seems to be well above 60%. In other words, 2 out of every 3 users won’t actually finish their purchase – yup very depressing. That’s when the abandoned cart recovery tool can help you. This is a feature that allows you to interact with those who never placed the order in order to gain them back. 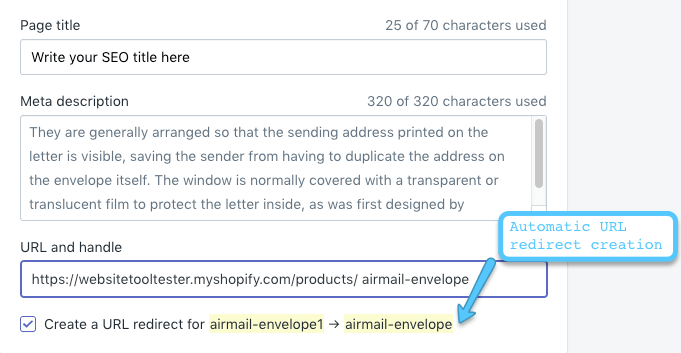 For example, you can set Shopify to send automated emails with a discount code to those users that never finished the purchase process – assuming you know their email addresses. If you need more control over this (e.g. 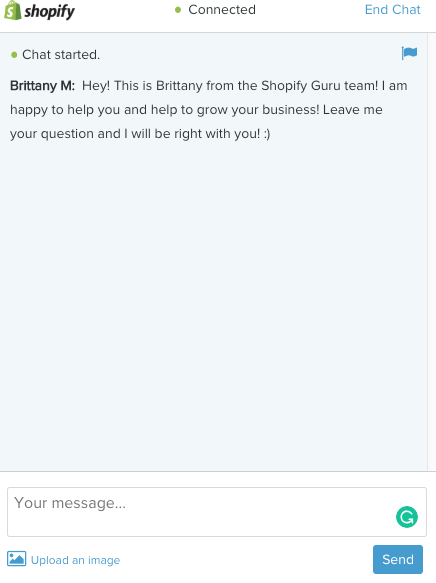 email sequences, pop-up, etc) there are apps in the Shopify App Store that can help you. Sidenote: Shopify only includes this feature with the ‘Shopify’ and ‘Advance Shopify’ plans. Yes, I know, the whole point of getting Shopify is to sell your goods and services online, right. But with Shopify, store owners can also sell the old way, face-to-face. If you wish to sell offline, it’s possible to integrate Shopify’s PoS (point of sale) with your physical sales channel – even if you are on the go. The great thing about it is that it’ll be completely integrated with your Shopify backend, so your reporting, inventory management, prices, etc are automatically synced. You can start small, by selling items using the Shopify PoS app (e.g. using your smartphone or tablet) and accept payments. You won’t need anything else. Pretty useful to test physical store ideas. But if you are planning to sell offline a lot, you may want to look into buying PoS hardware to make your life easier. For example, Shopify offers a couple of card readers that you can connect to your smartphone or tablet – they cost between $30 and $90. It’s also possible to buy a complete kit with a receipt printer, card reader, cash drawer and an iPad to manage your physical sales. Sidenote: If you are based outside the US, Canada or the UK, you can’t purchase (PoS) hardware from Shopify. However, you can get a third-party device. Shopify SEO – Any good? I get dozens of SEO questions a month. And a lot of them are users wanting to know if they’ll ‘conquer’ the first organic positions with this website builder or that other one. Shopify URL structure isn’t 100% customizable. For example, product pages will include always ‘/products/’ in their URL – this can’t be changed. Shopify auto-generates the Robots.txt file, sadly you can’t customize it. Shopify doesn’t make it easy to create sub-categories, which can be an SEO pain for some. Although you can create non-ecommerce content easily, it can be a bit limited (e.g. not possible to add widgets or maps). Sometimes, you may need a bit more (content) flexibility to support your overall SEO strategy. However, despite the above-mentioned pitfalls, I would say that Shopify’s SEO is good and intuitive. For example, customizing most of your SEO parameters (e.g. title tags, descriptions, slugs, etc) is easy. I really like the redirect system they have in place. When you change a URL, Shopify will automatically create an optional redirect from the old URL to the new one – so you don’t generate 404 errors. For more information about Shopify’s SEO, please check this detailed Shopify SEO review. Sure, Shopify comes with a blog you can use for your content marketing strategy. It even has a lot of blogging features you’ll need but it can feel limited – especially when compared to platforms like Weebly or WordPress. Sidenote: Some of these missing features can be added installing an app from the Shopify App Store. I have to acknowledge that Shopify approach to blogging is a way better solution than what BigCommerce or Volusion offer and should be good enough for most ecommerce sites. But of course you could always put your blog on a subdomain and let it run through an external platform. But that comes with its own set of challenges. Creating other pages is also possible and relatively easy. But the page editor can also feel limited, especially if compared to website builders like Wix or Duda. There aren’t either many page elements available (e.g. galleries, maps, social media buttons, etc.) and the layouts are very rigid. Shopify reports are OK, good or amazing, depending on what plan you have. I am not a big fan of this and I believe everyone should have access to all the data – as Shopify competitor BigCommerce does. Finally, if you have the Advanced Shopify plan or Shopify Plus, you’ll be able to create custom reports. Using their filters you can dig as deep as you need into your data. Connecting Google Analytics (with conversion tracking) is also possible. So after all, you may not even need Shopify’s reports – although not all the Shopify Reports data can be found in Google Analytics. Additionally, there are dozens of reporting apps you can get from the Shopify App Store – personally, I’ve never used any of these apps, so I can’t comment on their quality or features. Shopify has an app market where you can find extensions (for adding extra functionality) for your online store. Similar to the ones you can add to your smartphone. Many solutions (e.g. BigCommerce, Wix, Weebly) have their own version of this Shopify App Store. But Shopify has an insane amount of apps. From email marketing integrations to dropshipping connections, you name it. These can certainly save you a lot of money and time – especially compared to custom-developed solutions. There are a bunch of free apps (over a thousand), but many others are paid apps. And the app quality… it really depends on the app – luckily you can read reviews before installing them. Some of the apps are even developed by Shopify themselves. For example, the digital downloads extension or the Instagram, Facebook and Pinterest integrations. The not so cool thing is that it can get expensive. For example, if you need 2 or 3 paid apps, you may be looking to pay $50 or $60 extra a month – not every ecommerce owner can afford this. You can contact Shopify 24-hours support via email, phone or live chat. One of their Support Gurus will take care of your question – yup, that’s their real job title. In general, my experience with Shopify support has been good. They are (relatively) fast and helpful. But this depends a lot on the type of question (e.g. how technical is it) and your luck with the support agent. We also tested their support on a broader scale, comparing it with 9 other website builders and ecommerce platforms. Shopify came out 2nd, thanks to both the quality of their answers and the useful knowledge base. In this test, Shopify’s rival BigCommerce only made it to the 5th place. In my opinion, support is one of the biggest advantages of using Shopify (or similar solutions) over a traditional CMS (like WooCommerce). Being able to ask an expert when you’re stuck can save loads of hassle. Personally, I don’t want to contact support for each tiny question I have, that’d be very unproductive. Luckily, Shopify has many detailed tutorials and guides, check them out first if you have a question – they may solve your doubt instantly. And if you need professional help with your store, Shopify has a directory of (certified) Experts you can contact – make sure you read the experts’ reviews before hiring one. Being hacked is not fun, it can put your business under serious pressure. So I don’t have to tell you how important is to keep your store safe. Unlike WordPress and similar CMS, Shopify takes care of updates and security matters in the background – I love this. I’ve wasted many hours trying to fix WordPress stuff after plugin updates that went wrong. 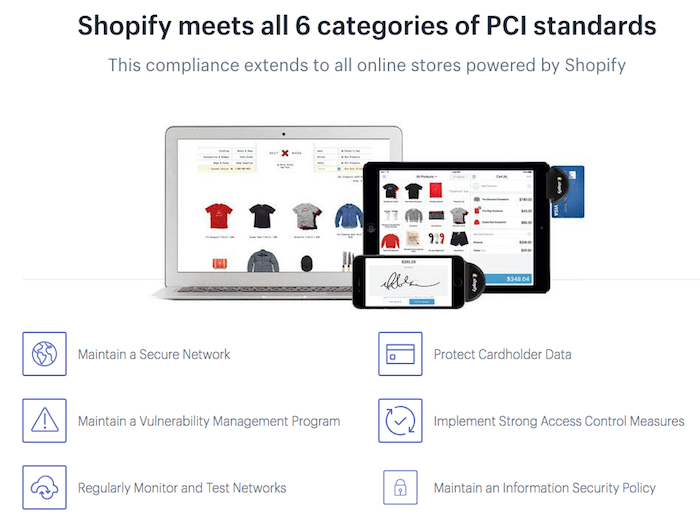 Shopify system runs on Level 1 PCI compliant servers – mandatory to accept credit card payments. SSL encryption (at 256-bit) is enabled for every Shopify store too – to keep your visitors’ data safe. At Shopify, they do have a backup system in place. In desperate times, they can restore your online shop. But this is not an official service, they advise you to keep regular backups of your site by exporting a series of CSV files – I don’t like this solution as it’s time-consuming. That’s why adding a more advanced backup solution from the Shopify App Store (e.g. Rewind) may be wise – very helpful if you deleted content (e.g. products) by mistake. In short, you only need to do regular backups and have a strong admin password. Shopify Review Conclusion: Is this tool for you? Shopify is one of my favorite solutions to create online stores with. It has many cool features and advantages, but also a couple of downsides you should consider before deciding. Keep on reading to find out. Adding products as well as managing payment and shipping options and processing orders is absolutely painless. Their layouts (templates) can be modified to a large degree without any programming knowledge. Shopify can help you with your content marketing too as it comes with a blog (and more). Although with some limitations. It’s possible to change your store’s look and add extra-functionality by installing new templates and apps in seconds. If you are a programmer (or hire one), you can have complete control over your online store customization. Having official 24 hours support is something I value a lot. No matter how fast your business grows, Shopify can accommodate small, big and colossal ecommerce projects. If you are into dropshipping, Shopify integrates with several apps/providers (read guide). A nice perk is that you can sell offline with their PoS solution. To sum up, I like (you will probably too) Shopify because it’s straightforward but at the same time you can develop custom solutions if needed. Additionally, I don’t have to worry that my stores will get too big for Shopify; their system will grow with them. I think Shopify Prices are fair, but you’ll definitely need a budget as it starts at $26 per month. I am not a big fan of their extra transaction fees if you don’t use Shopify Payments – they can add up quickly. Setting up multilingual stores isn’t easy (nor cheap). A good solution for you could be this (paid) app. Some of the coolest features are only included in the higher plans (e.g. abandoned cart). As you can read above, it has a couple of SEO issues (more information). Our recommendation: before going “big,” consider picking the “Basic” plan ($29/month) if you need more features you can always upgrade. WordPress users can integrate Shopify Lite for only $9/month. OK, this was a long article, but I hope it helped you clarify what to expect from Shopify. But if you are still not sure if Shopify is right for you, leave me a comment and I’ll try to help you decide. Is Shopify the right choice for you? BigCommerce and Shopify are relatively equal. But for some, even their small differences can be crucial: BigCommerce is in the lead when it comes to SEO. This added flexibility can be valuable in competitive markets. Also, unlike Shopify, BigCommerce doesn’t charge any transaction fees. However, they will put you into a higher pricing plan as you hit certain thresholds in your sales. Check out our Shopify vs BigCommerce comparison for more details. Wix Ecommerce plays in a different league as it’s made for smaller stores. So if you primarily want to have a great looking website with a blog and an added shopping cart, Wix is for you. As it’s geared towards beginners, adding content and managing your store is a lot easier than with Shopify. It’s not to be underestimated as it comes with customer accounts, lots of payment methods and the ability to sell digital products. Read our comparison of Shopify vs Wix here. Still not sure what store builder you should use? Let our smart finder decide for you in 2 minutes. This image shows you the website availability of our Shopify demo website during the last year. Ideally the uptime is 100% with zero outages. In ecommerce you would generally want to have an uptime of 99.95% or higher as every minute your website is down will cost you money. Shopify is as good as it gets with an unparalleled 99.99%! 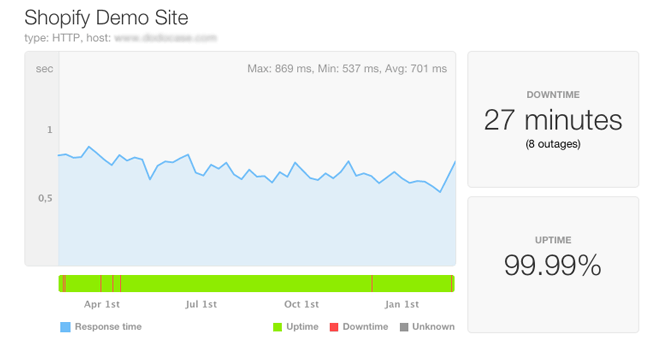 Response time: nobody likes a slow website. Your online store generally should have an average server response time of less than 800ms or it can feel slow, however, the overall experience also depends on the page speed (see next tab). For an online store, it is extremely important to load fast. In this test we randomly selected three blank Shopify templates and ran them through the Google PageSpeed testing tool. For an online store, a rating of 82 (for desktop) or higher is desirable. Can I sell digital goods like MP3s, videos or eBooks with Shopify? Yes. You can sell files with Shopify. Find more information here. What payment fees does Shopify charge? There are two kinds of fees: one that Shopify charges and another that you have to pay to the payment gateway processor you use (e.g. PayPal or credit card payment processors such as Stripe or Authorize.net). Depending on your pricing tier, Shopify would charge somewhere between 0,5% and 2% plus the payment processor’s fee (typically 3% + 30¢). You can avoid Shopify’s fees by using the Shopify Payments gateway (only available in USA, UK, Ireland, Canada and a few other countries). Can I upgrade or downgrade my plan easily? Yes, you can always change your plan type. An upgrade or downgrade will initiate a new billing cycle and close the current one. Existing funds will be credited to your new plan. How do I cancel my Shopify subscription? To cancel your online store, go to Settings > Account page. Select the “Close my Store” option. Can I use Shopify on my phone? Shopify has a free app for Android and iOS that will let you create and manage your online store on the go. Among other things you can: process orders, manage products, add and contact customers, change your template and check the performance of your online store. We welcome you to this review of the Shopify e-commerce platform! If you have ever bought an article online, chances are that you did it through one of Shopify’s over 90,000 online stores. Unlike eBay or Amazon Market Places, Shopify allows you to sell your products on your OWN website. In this review, we try to find an answer to whether it is really possible to set up an online store without any programming skills. At first glance, Shopify seems a bit expensive. However, there is a $14 per month plan available, which is little bit hidden on the pricing page. You can upgrade and cancel anytime you want. For all plans, there is a 14 day free trial that doesn’t require your credit card. After having registered, we see our dashboard. It’s great that Shopify takes you by the hand and gives you hints regarding what to do next. Normally, you would start by picking and modifying your layout. Of course, you could also start immediately by adding new products. Let’s now take a look at the theme. Here we see our active theme. It looks like this. As you can see, we have already set up a little online store that sells vintage postcards and envelopes. Let’s now go back to the editor. Under “Theme Settings,” you can adapt your layout without any programming skills. You see the result in the preview. In case you don’t like the theme, no problem! Visit the Theme Store and pick another one. Provided you or your programmer knows how to code the “Liquid” language, you can also create your very own theme. Let’s now head to the shipping settings. Here you can define your shipping rates worldwide or for each country individually based on order price or weight. It’s also possible to calculate the costs with a carrier or fulfillment/dropship service. Finally, let’s have a brief look at taxes. The tax rates are added automatically when you add a shipping destination. Of course, it is possible to change the rate with a tax override as well. Enough preparations. Let’s add a product. Under “Products” we see a list of our existing products. In the upper right corner, we can “Add a product.” Since this process is quite self-explanatory, we’ll show you the settings on an existing example. Of course you can also add variants so you don’t need to add the same product over and over again. Upload your images and decide if you want to add your product to a collection. Tags can help your customers find similar products. Very important: don’t forget to set your search engine settings for higher rankings. Last but not least, save everything. This is what our product looks like. Nice, huh?! Before you launch your online shop, you can do some test orders. If you have received a new order, you will be notified. That’s what it looks like. By clicking on the order, Shopify provides you with detailed information of the customer and the current state of the order. Also, very powerful is the Shopify App Store. For instance, the site-wide contact button you see here is from the app store. There are plenty more useful apps available for free. Similar to a website builder, Shopify also features a blog with all the bells and whistles. A blog is essential for a content marketing strategy in order to pull in search engine traffic. Keep this in mind when deciding on an e-commerce platform. Here you would fill in your blog posts. Add a picture, some tags, and all the other typical stuff you’d expect in a blog. You can also edit comments in your blog. Here’s the result. Of course, all this quality has its price. You could say it’s quite expensive compared to other online stores, but we think it’s justified. Shopify provides you with all the tools you need set up a successful online store. The rest is up to you! If you want to know more about Shopify, please go to our detailed Shopify review. And if you want to find more information about different online shop providers, please make sure to check out WebsiteToolTester.com. We hope you found this video useful. We would be very happy if you would like it on Facebook or YouTube! Thank you! Is there a backup solution for Shopify? The backup process that Shopify provides is not an easy undertaking as it’s a manual process that involves a lot of steps. In their App Store you can also find automated solutions: one is Rewind, which has pretty positive ratings and starts at $5 per month. Learn more here. What is the Shopify Exchange Marketplace? It’s a marketplace that allows you to buy or sell a Shopify online store. If you are looking for store ideas it’s a great place to shop around as there you can also check what the owners are actually making. Similarly, it’s nice to know that there’s a marketplace available where you’d be able to sell your Shopify store should you one day want to move on to a new project. Go to the Exchange Marketplace. Hi! My name is Armin Pinggera and I've been the tech guru at WebsiteToolTester since 2013. After having tested hundreds of web tools and site builders, I'm convinced that anybody can create a website or online store by themselves. Please leave a comment if you have any questions! 17 Jan 2017 – Shopify’s new templates provide better design options. 09 Aug 2016 – Shopify payments: update in supported countries.